I have a passion to promote bicycling and walking as a viable means of transportation within the multi-modal spectrum. In the U.S., walking & Biking make up 12% of all trips and 14% of all fatalities, yet only receive 1.2% of Federal transportation funding. In the States, more than 25% of all auto trips are less than a mile in length. I will explore the economic, social and health benefits of these modes of transportation. There's good news here in my town of Dunwoody! August 22, 2011, the council is expected to pass a Complete Streets policy. First off, it's been awhile since I've posted anything. Nothing personal, but sometimes you have to focus on other things. Such as your day/paying job, home, family, R&R, etc. I'll be charging back in the next few weeks and have been working behind the scenes on a few things in the city, including helping develop a Complete Streets policy. I serve on the Sustainability Commission for Dunwoody and also served on the Advisory Committee for city's first Comprehensive Transportation Plan which was signed off earlier this year. In the Transportation Plan, there was a recommendation to adopt a Complete Street policy. In the Sustainability Commission, we voted and recommended the policy, as well. Putting it all together with staff, Public Works, the mayor & council it's now becoming a reality. What does this mean? Quite simply, it's the formalization of assuring that when the city works on transportation projects using publicly owned rights of way (i.e. ; roads & streets), they will not be strictly focused by default on motor vehicles. It's a huge paradigm shift that's being experienced all throughout the States. Locally, throughout the year-plus of public input meetings on its future, the citizens of Dunwoody have spoken loud & clear: Better ways to walk or ride a bike to a destination. But guess what happened months earlier? Mr.Michael Smith, the Dunwoody Public Works Director applied the principles of Complete Streets and Routine Accommodation in the 2011 Capital Paving project. He made about 3 miles of Bike Lanes appear out of thin air. How? Except for about a 400-ft stretch of road, he simply is instructing that after the roads are resurfaced, to paint the vehicle travel lane widths to10-ft. The 400-ft segment had a grass shoulder and was in the publicly-owned Right of Way. 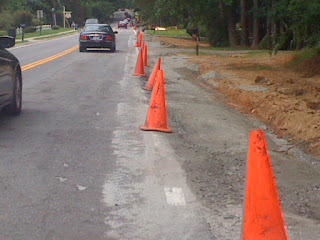 Out of the annual $2M paving budget, it only cost $40k to widen the road width a few feet and voila, a contiguous mile-long segment of bike lanes on Roberts Drive, passing Austin Elementary school supporting their Safe Routes to School program, the Dunwoody Nature Center, several residential neighborhoods, a couple of churches and stopping at the border of Sandy Springs (I hope our sister city will be able to pick up this momentum and continue the bike lane). 1. Revenues from motor vehicle fuel taxes and other fees only account for just over 50% of the cost of building and maintaining roads and bridges. 2. It has been the government's role at all levels for the past several decades to heavily subsidize and reallocate wealth to support motor vehicle transportation. 3. In every state in the nation, including Georgia, bicycles are legally protected and are able to use the publicly owned right of way on our roads -- which we all own together. 4. Until roads are privatized, with drivers paying tolls and other direct forms of payment to use such, bicycles will be able to use them. 6. Georgia's obesity rate has doubled in the last 15 years; and it's a great way to get a bit of healthy and family-friendly exercise. Also, as we know that "Rome wasn't built in a day", it takes long-term planning to add bike lanes and other accommodation. Heck, when I was a kid, it used to be safe to ride my bike to school. Across the nation, you're finding parents and elected officials coming together to add bike lanes and paths so their children can choose to walk or ride their bike to school. That makes one less car on the road in the morning if the parent normally drives their child to school. Let's work together to insure that this policy does not collect dust. With turnover of elected officials and staff, and with future Design & Engineering of transportation projects, please do your part to offer citizen input, feedback and a bit of "oversight", to keep the Complete Streets DNA alive in Dunwoody. ...And please thank the Mayor, Council and Staff for making this a reality! !